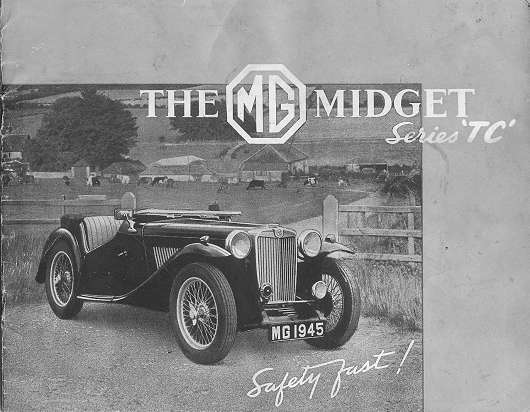 The MG Midget sport cars produced from 1936 till 1955 are known as the MG Series T-Type Midget. The production was started in 1936 with the TA, after which the TB followed just before the outbreak of world war II. After the war in 1945, the production was continued with the MG TC. 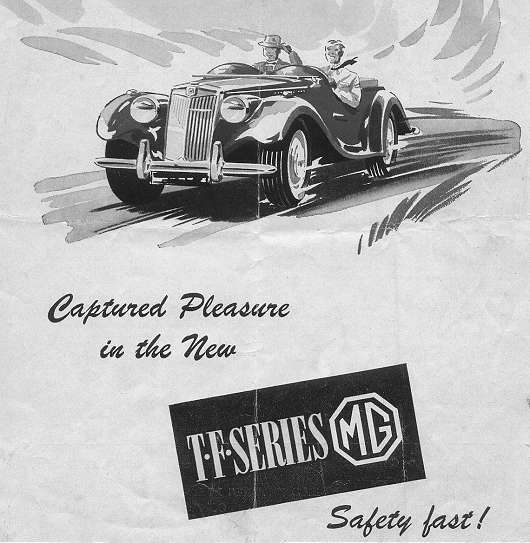 In 1949 the MG TD was introduced, after which in 1953 the latest model in the T-series was introduced, the MG TF. The production was stopped in 1955, 20 years after of the first T-type was introduces. 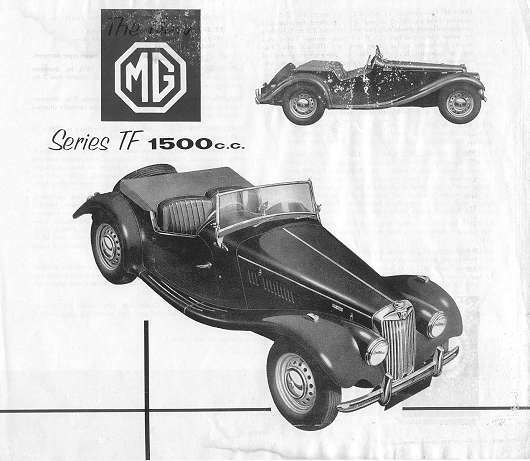 The MGA was introduced in 1955, for which the T-types were the predecessor's. 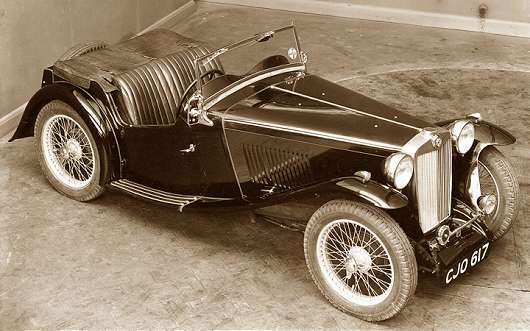 1936 - 1939 MG TA Midget. 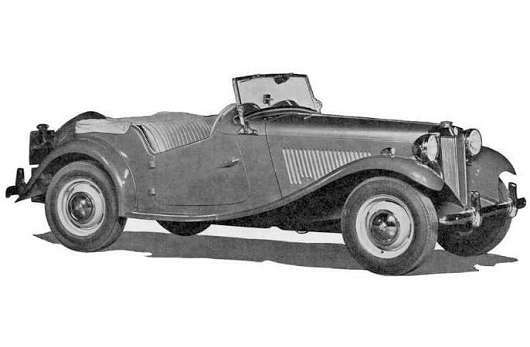 1939 - 1939 MG TB Midget. 1949 - 1953 MG TD Midget. 1953 - 1955 MG TF Midget. 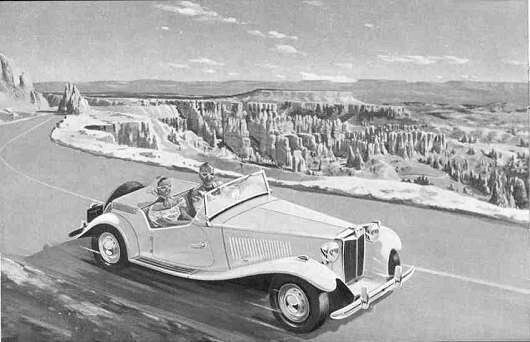 In 1936 the MG Car Company made a dramatic change in the design of their sports cars. 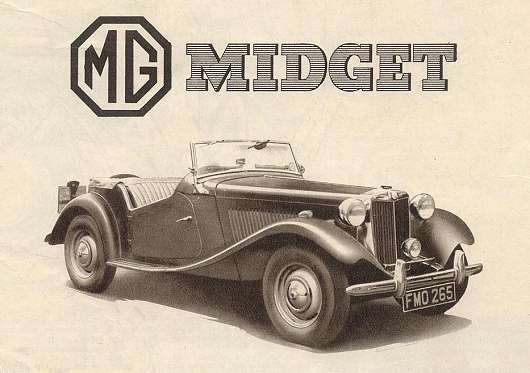 In this year they introduced the MGTA Midget. The MGTA originated the familiar T-Series design element and to the casual observer, it is hard to distinguish from the MGTC. The MGTA sported the famous radiator design, the swept wings, running boards, folding windscreen, and large accessible bonnet. It was a two seater sports car with a foldable hood and side curtains. Just over 3,000 MGTA's were produced in three years of production. 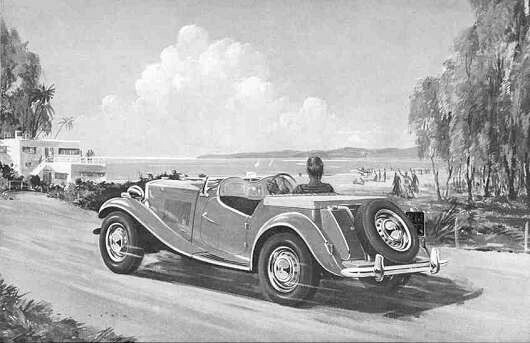 It was before the war, in the Spring of 1936, when the replacement for the MG PB appeared. 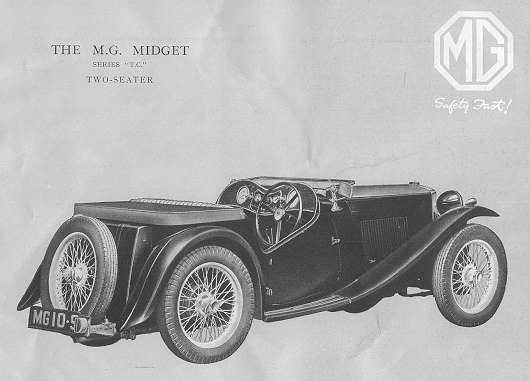 The Cowley- inspired TA Midget used many components of Morris origin and , at first, was not popular with the "hardy" MG enthusiasts. However, this resistance was soon overcome and the car widened the appeal of sports cars which had previously been looked upon as being temperamental and difficult to drive. 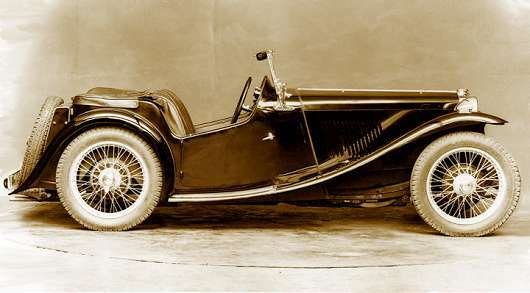 The TA's chassis was of traditional MG design, but the tubular crossmembers seen in previous models had been replaced by less stiff channel sections. Also, the forward portions of the side rails had been made as box sections to stiffen them, which was needed as the engine mountings were of rubber. Suspension was by the now familiar leaf springs front and rear, but the brakes were hydraulically operated for the first time on an MG. The engine had been changed too. Gone was the neat, but demanding, ohc unit and in its place was a 1292cc, pushrod, overhead-valve, four-cylinder engine. This was essentially the same as that used in the Morris 10, but the MG was equipped with twin SU carburettors and produced around 50bhp, which was a significant increase compared to the PB. This was mated to four-speed transmission which had another first for MG - synchromesh. The TA became very popular and, inevitably, found its way into competition where it acquitted itself well. However, the engine was not happy being run at high revs because of its unsuitable valve timing and weak bottom-end. To overcome this, the factory developed methods of tuning the unit and supplied the information to those who wanted their TA's to go faster. 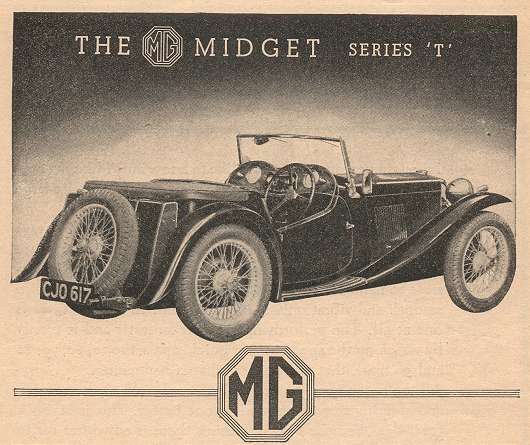 In the summer of 1939, as the war clouds were gathering, MG announced the TB Midget. In terms of chassis and body options it was essentially the same as the TA, but the TB had a new engine which was a 1250cc, ohv, four-cylinder unit. Taken from the new Morris 10, and known as the XPAG engine, it had a much stronger bottom-end than the previous unit, better valve timing and a better designed cylinder head. These design features combined to give a power output of 45bhp. 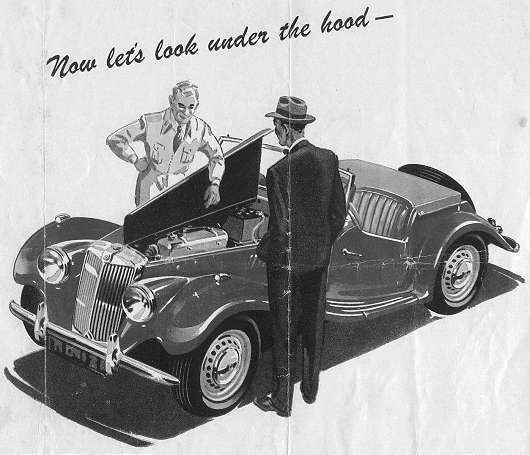 The MGTA suffered from a poor performing engine and in 1939 the MGTB was introduced with the now famous XPAG engine. Only a few were produced as in a few months World War II broke out. 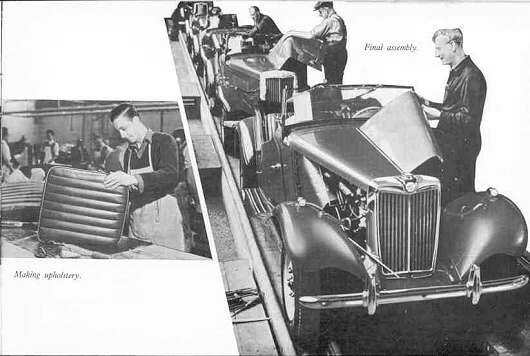 At the outbreak of the Second World War in 1939, production of cars at MG in Abingdon had given way to production and maintenance of machines of war, as it had at most other engineering plants over the whole country. A very wide variety of jobs were undertaken, ranging from servicing guns and production of aircraft parts to overhauling tanks. No job was too large, too small, or too difficult for the workers at MG. 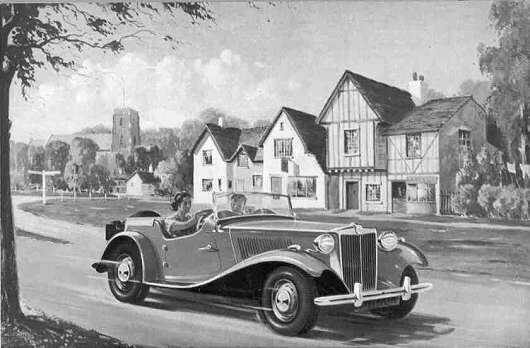 The MG TC in an original 1945 brochure. 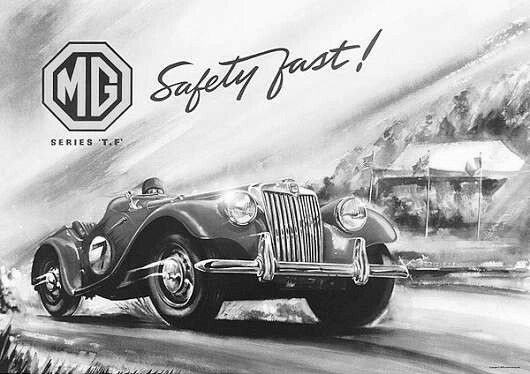 During World War II production of MG's ceased as the MG Car Company was put into service for the war effort making tanks and airplane parts, and other military items. 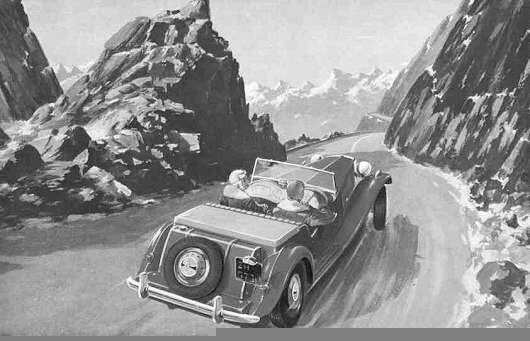 When the war ended the the MG Car Company was anxious to get back to making sports cars. They revisited the MGTB and made a few subtle changes. These were in the form of a wider body and shackles replacing sliding trunnions for the spring mounts. The Nuffield Organization also made another drastic change. They started taking an active interest in selling their sports cars in North America. It appears that during the War a number of American GI's had an opportunity to experience the T-Series MG's. When the War ended a number of these cars were imported and then formally sold into North America, especially the United States. With a return to peacetime in 1945, thoughts at MG turned once again to building cars, but things were never to be the same again. A socialist government was in power, the country's industry had been ravaged by bombing, and wartime shortages had led to rationing of just about everything. Although there was a considerable demand on the home market for any form of personal transport, raw materials were in short supply which was controlled by the government. With the urgent need for the country to earn foreign income to aid reconstruction, priority was given to supplying raw materials to those companies who concentrated on exporting their products. The phrase "export or die" had a very real meaning. Since little development work was carried out during the war on the post-war generation of cars, so most manufacturers simply dusted off their pre-war models, tidied them up and wheeled them out. MG was no exception to this, but in the pervading atmosphere it was clear that the big luxury saloons of the pre-war era would not be looked upon with favour. 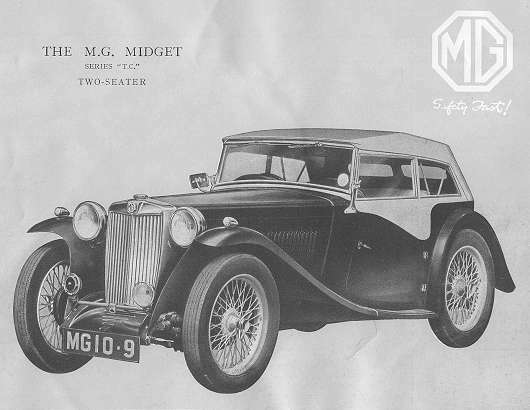 Consequently, it was decided to concentrate initially on the car which had been the mainstay of MG's reputation as a manufacturer of sports cars - the Midget. The TC was offered in one body style only - an open two-seater which was very similar in appearance to the TB model. All the old features were there : the humped scuttle with folding windshield, cutaway doors, swept front and rear wings, a slab-type fuel tank and rear-mounted spare wheel. It was almost as if the intervening 5 years had never happened! 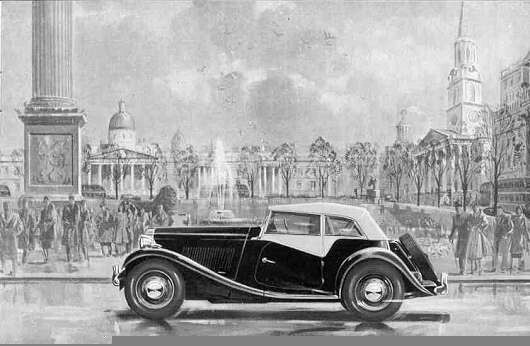 Aware that the more cars they could export, the greater would be their allocation of raw materials, MG sought sales around the world and succeeded in generating a substantial demand for the car. So successful were they that, in the cars four-year production run, from 1945 till 1949, some 10,000 TC's were built, a substantial number of which were shipped to the USA where they were to generate new enthusiasm for sports cars and motor sport. It is quite remarkable how a car which was basically a "stop-gap" should have enjoyed so much success, generating sales figures far beyond those experienced before the war. 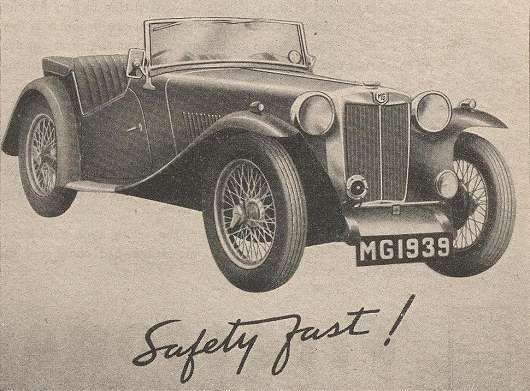 In 1949 a small group of MG leaders, headed by John Thornley, got together to try to create a car that was acceptable to the North American marketplace while at the same time would limit the investment of the Nuffield Organization. Clearly it would be impossible to completely create a new car, not only from a financial point but from a timing standpoint as well. What was needed was a little of the old, sprinkled with a little of the new. Another key factor was to borrow or incorporate features found in other Nuffield cars of the time that were more up to date than the MGTC. It was not, as one might have expected, a car with a totally different, modern appearance, but yet another Midget in the familiar mould. The TD Midget, while it certainly had the appearance of a Midget, had much which was different under the skin. Early 1949 MG TD, with closed disc wheels. Quickly a team of MG personnel took inventory of the components of the Nuffield Organization that they had to work with. They discarded the TC's frame because it was to light and not rigid enough. They found what they wanted in the Y types. A small modification to the frame was to have it sweep over the rear axle rather than under. This gave them more travel in the rear springs so they could increase the damping. In addition they adopted rack and pinion steering and front coil springs and wishbones. This and the change in rear end suspension allowed for a smoother ride and better handling than the MGTC. One of the major changes was to reduce the wheel size from 19 inches to 15 inches and increase the tire width to 5.50. All of these changes made the MGTD a superior riding car over the MGTC. Early 1949-1950 MG TD, with closed disc wheels as shown in the workshop manual. Because of the use of the larger frame the body became 5 inches wider. Although the body increased by 5 inches, only one inch actually found it's way into the cockpit so there is an indiscernible difference in the seating width. The biggest change that people notice about the MGTD from the MGTC is the lack of wire wheels. As part of the Nuffield cost cutting challenge the more expensive wire wheels of former T-Series cars were replaced by solid steel wheels. For the entire production run of the MGTD the factory took heat for this decision. They constantly tried to create implausible technical reasons why wire wheels would not work but their reasons were never accepted by the marketplace. In fact wire wheels were one of the most popular aftermarket accessories at the time. Nuffield itself had to offer an upgrade kit to wire wheels during 1953 because the essentially identical 1954 MGTF chassis sported wire wheels as an option. Other changes between the MGTC and the MGTD were more stylized wings, partially due to the smaller wheels. A dual production capable LHD or RHD model, better brakes, adjustable steering column, and an interchangeable dashboard for left or right hand driving were also incorporated. An optional radio and heater, as well as many accessories designed to improve the performance of the car were made available. The first model set the stage for what the TD was. 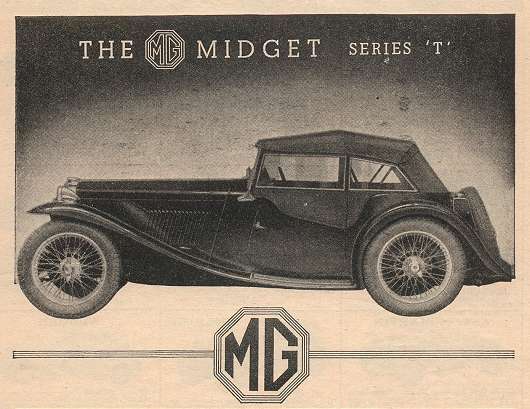 Because of the short amount of time from the inception of the TD to the delivery of the first cars, not everything was quite as the MG Car Company would have liked it. In fact they were still making TCs on the production line when the first TDs were being produced. In addition, other cars such as the MG Y-type saloon and the Riley RMA and RMB were also being made on the same assembly line at the time. This says something for the flexibility of the Abingdon workforce and of the factory. Apart from revised mountings, the engine for the new MG TD was the same 1250cc XPAG unit fitted to the previous model, the MG TC. There were many subtle changes to the TD, but most were unnoticeable to the untrained eye. One exception was the change from solid steel wheels to ventilated steel wheels. This change was essential because there were complaints that the brakes on the early cars were fading due to inadequate cooling. Another change was to stiffen the chassis by adding an internal steel hoop under the dashboard. This helped to prevent `scuttle shake', although the later chassis still seems to flex quite a bit when pressed into corners. 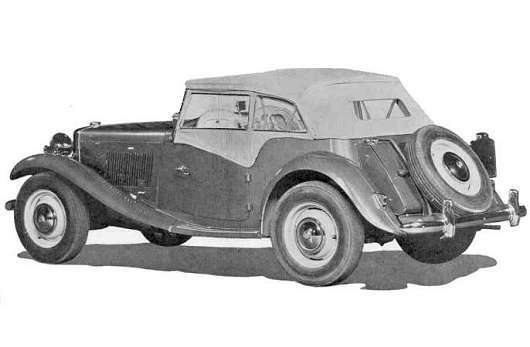 The TD had a completely new chassis, which had been developed from that used in the Y-Type saloon. It was a much sturdier and stiffer frame than the old Midget chassis, as it had box-section side rails and crossmembers and it was of all-welded construction. Unlike the previous Midgets, the chassis was kicked up over the rear axle. Consequently, the rear leaf springs had a greater camber than before, and they were softer too being controlled by lever-arm shock absorbers. At the front, the old beam axle and leaf springs had been dispensed with in favour of an independent system comprising double wishbones and coil springs. The upper wishbones were actually formed by the levers of the shock absorbers. The complete front end design was common to the Y-type saloon and was to form the basis for the front suspension for many future MG's. MG TD assembly in Abingdon. One departure from the old Midget which raised the hackles of the "hardy" MG enthusiasts, was the use of 15 inch pressed steel wheels rather than the old spindly 19 inch wire wheels. These looked slightly out of place on a car with such old-fashioned bodywork, especially at the rear where they didn't quite fill the wheel arches. The engine and transmission were again the same as the TC, as was the body style, although the latter was a little wider and the wings were more enveloping because of the wheels. 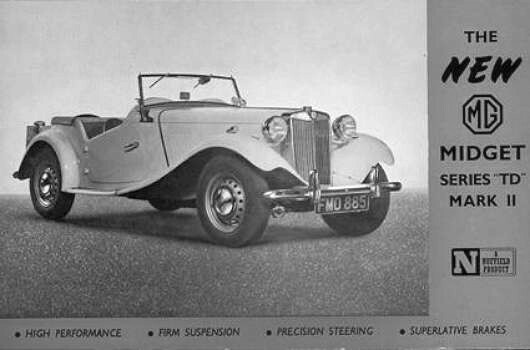 For the first time, an MG was equipped with bumpers fore and aft which, it was suggested, took away the slightly "cheeky" air of the earlier cars and gave the TD a more "civilised" look. And in a way this was true, as the TD was certainly more comfortable to drive than any of its predecessors. As a result of this, the TD found an even larger market than the TC, selling almost three times as many in a similar four-year production run. Again, a substantial number of the cars produced went abroad, particularly to the USA. A Mark II version of the TD was introduced during its production run, having a slightly more powerful version of the XPAG engine (57bhp) with a higher compression ratio and bigger carburettors. There were also improvements made to the suspension, while the one-piece seat back and individual seat cushions gave way to a pair of bucket seats. In 1952, centre-lock wire wheels were offered as an option. By this time, sales of the TD were beginning to falter, but MG had the prototype of its replacement ready to go into production. The car, code named EX175, was based on a modified TD chassis and mechanicals but with a beautiful streamlined bodyshell which was right up-to-date. Sadly, it was to be turned down flatly by the boss of the now British Motor Corporation as a deal had already been signed to build a similar car - the Austin-Healey 100. Due to the fact that the United States had much more cash available to spend on entertainment and sports than did war torn Britain, the Nuffield Organization made a drastic change in their marketing, focusing on North America. In 1949 the MGTC was fitted with many elements to make it more North American such as front and rear bumpers, twin horns, and dual tail lamps. Even by making these changes only a fraction of the MGTC's were imported into North America. There were still too many issues with a car of this type for different North America conditions. Amongst those were driving on the right hand side of the road rather than the left, more high speed maneuvers such as freeways, a softer ride, and some additional creature comforts. What was needed was a total redesign of the MGTC if the MG Car Company was to capture a significant portion of the North American market. What was missing was a total commitment from the Nuffield Organization to do so. About 50,000 MG TD's have been produced. 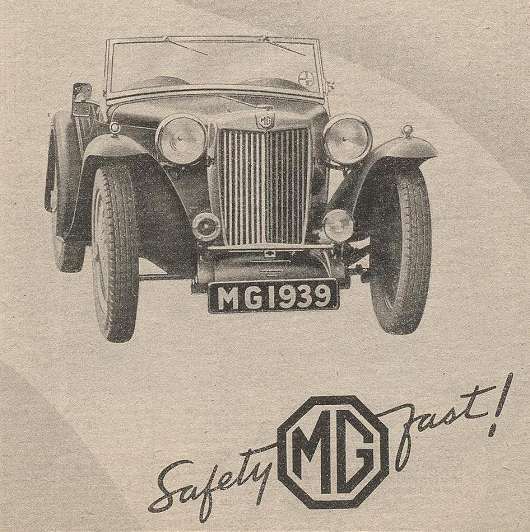 The first MG TDs were manufactured in late 1949, and the model was formally announced in January of 1950. Only 98 TDs were made in 1949, 2 RHD and 96 LHD. There were a total of four model years - 1950, 1951, 1952, and 1953, and the models are nowadays referred to as the MG TD, TD2 and TD/C MK II. Below you will find a brief description of each model. In July 1951 the 1250cc XPAG engine received a new block, a new sump, a new bell-housing and a new flywheel in order to accommodate a larger clutch. The engine number prefix was changed to TD2, and MG TDs fitted with this engine have subsequently become known as TD2 models, although contemporary marketing materials did not use this designation. The changeover occurred at engine number XPAG/TD2/9408. (The TD2 should not be confused with the MG TD Mark II, see below). Several changes were introduced between August and November 1952 as sales of the TD started to fall in favour of cars like the TR2 and the Austin Healey 100. These included circular rear lamps incorporating flashing turn signals, and a three-bow frame replacing the 2-bow frame for the hood. Also, the wiper motor was moved to the centre of the windscreen. 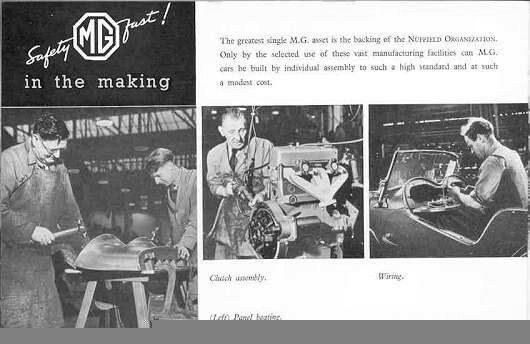 By the middle of 1950 the MG factory were also producing some special MGTD's known as the TD Mark II or the TD Competition Model. These cars were essentially regular MG TDs that had been given some extra factory accessories and tuning equipment. Initially there was no standard specification for these cars, and during the production of the MG TD the specification of the TD Mark II would change. The only standard feature appears to be the provision of additional Andrex friction shock absorbers front and rear. Some of the modifications on offer included a modified cylinder head raising the horsepower of the engine from 54 bhp to 57, wider wheels, larger tires, higher rear axle ratios, twin fuel pumps, and larger carburetors. You could even have a supercharger. Most of the features of the Mark II were a part of the staged tuning that was described in various publications and offered as a factory tuning manual. It was also possible at that time to order anything for a regular TD that the Mark II model offered, and more, and so many owners opted to buy a regular TD and then improve the performance of their car well above what the Mark II could achieve. Production of the MGTD peaked in 1952 and 1953 found sales of the car starting to fall. Again the MG Car Company found itself in need of a whole new automobile but without the support of the parent BMC Organization. The Arnolt MG was the result of an American, Italian, and English collaboration. Mr. Arnolt was an eccentric American enthusiast, industrialist and businessman who had a Chicago-based MG, Riley, and Morris distributorship. 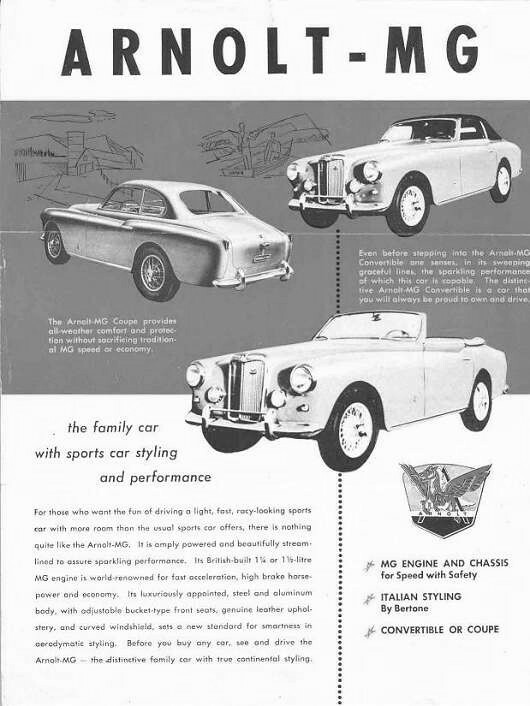 At the 1952 Turin Auto Show, he saw a special Bertone body on an MG chassis and arranged to buy 200 bodies to place on MG TD chassis and sell as complete cars. Eventually, after the construction of 102 examples, MG was no longer able to supply chassis, and to make good on his deal with Bertone, Mr. Arnolt started another project with them, which would evolve into the Arnolt Bristol. The MG Arnolt was a more elegant, spacious, and refined alternative to the standard MG TD, and was available in both open (35 examples built) and closed (67 examples built) form. The doors, hood, and engine lid were made of aluminium, and the body welded to the chassis rather than being bolted. The cars were generally fitted with the standard 1250cc engines, though a small number of cars were fitted with the 1500cc MG TF engine. They cost about a third more than a standard MG TD, which also contributed to the low sales volume. Something had to be done about the flagging sales of the TD, but all that could be done at the time was to give it a facelift. Hence, the MG TF Midget was introduced in 1953. Essentially this car was the same as the TD, having the same form of chassis, suspension, brakes, steering, engine, and transmission. The bodywork displayed the most changes, although it still had that un-mistakable and by now old- fashioned MG style. The most obvious changes were to the front end where the radiator grille had been lowered and raked to give a lower hood line. The front wings were shaped so that the headlights could be faired into them rather than being separately mounted. At the rear there was little difference compared to the TD, although a valance was provided to fill the gap between the bottom of the fuel tank and the bumper. All that the Austin-dominated management would sanction was a face-lift of the aging TD, so in an effort to retain their marketplace until EX175 could be produced, the MG Car Company took a TD Mark II, made some cosmetic changes to the bodywork, and called it the MG TF. When the new TF was announced in September 1953 it was immediately shunned by the public. It was obvious that all MG had done was to tweak the engine, pound a bit on the body and fenders, add some more comfortable bucket seats, and throw on some wire wheels. In fact the car was worse in many ways because you could no longer open the bonnet sides to access the engine for maintenance, as you could on all the previous T types. By 1954 the 1250cc TF performed poorly compared with other sports cars of the period, so in September 1954 a more powerful 1466cc engine was fitted, replacing the XPAG. This larger capacity engine was designated XPEG, and the car was called the TF1500. The power of the engine increased from 57bhp at 5,500 rpm to 63 at 5,000, and the torque was increased by a massive 17%. This larger engine made the TF1500 a much better-performing car on the freeways and toll ways of North America, but by April 1955 something more modern was required, so after only 18 months in production, the TF1500 was retired and the factory geared up to start producing the MGA. This larger capacity engine did improve the performance greatly and made the MGTF 1500 a much better performing car on the freeways and toll ways of North America. Still the MGTF never captured the success of the MGTD and was replaced by the MGA within two short years.